Hands On Health Care Clinic > Blog > Chiropractic > What does pain or numbness down the outside of your thigh mean? 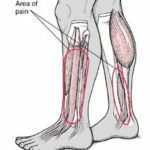 What does pain or numbness down the outside of your thigh mean? 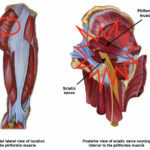 Are you experiencing pain or numbness down the outside of your thigh? You may have a common nerve disorder called Meralgia paraesthetica! Meralgia Paraesthetica is caused by chronic compression of the lateral femoral cutaneous nerve which travels from your lower back, over the pelvis and down the outer thigh. 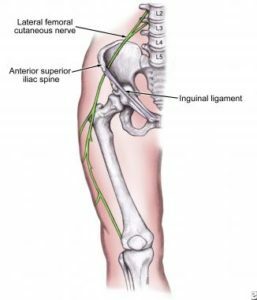 Compression of this nerve commonly occurs where the inguinal ligament crosses the pelvis as shown in the image to the right. So what causes the compression? What can you do to manage this condition on your own? Avoid prolonged sitting postures: take frequent breaks if working at a desk or try a standing desk which will allow you to work in various postures. Reassess your clothing sizes and material choices: especially if you know that you will be sitting at a desk or driving for a long time try to wear looser pants or skirts made of comfortable fabric that do not have tight elastic bands or belts! What can we do as chiropractors? Perform a history and physical exam to make sure that you are correctly diagnosed with Meralgia Paraesthetica! 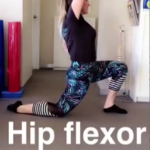 Assess your low back, pelvis and hip joints to ensure that the entire nerve path is free from skeletal restrictions! 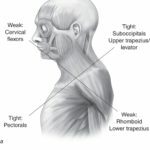 Assess the muscles and connective tissues in the area to address and correct any imbalances or potential adhesions! Do you still have a few questions about Meralgia Paraesthetica or how chiropractic can help you? Call Hands on Health Care at (02) 9949-3017 or book online at www.handsonhealthcare.com.au for your next appointment! Painful Sprints? You could have Shin Splints!